Jay Care Replacement Cover - One Piece Sealed System. 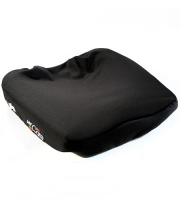 The Jay Care wheelchair cushion is a one piece sealed system - with the exception of its removable, washable cover. Having a spare cover will allow the cushion to be in continued use, and protected when the other cover is being washed. It is very easy to remove and replace (even for those of us with reduced dexterity) - and its very affordable price makes it an essential purchase!